So far in this series we have discussed integrating using common standards – launch-and-track with AICC or SCORM, or a tighter integration with the Questionmark LTI Connector. In this installment we take a look at a deeper, custom integration – the Questionmark Blackboard Connector. 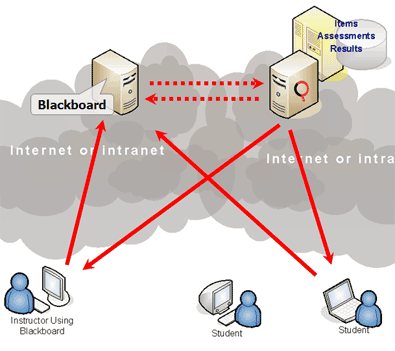 The latest version of Blackboard does have LTI capabilities, but we recommend using our Blackboard Connector instead of the LTI Connector as the Blackboard Connector has more functionality. As you’ll see in the following video, the Blackboard Connector handles a number of things behind the scenes – automatically creating groups that represent courses, adding participants and instructors to the appropriate groups, scheduling, etc. You also have a great amount of control – the Blackboard Connector has settings that allow you to control which courses and/or participants can interact with Questionmark from the Questionmark side, instead of automatically synchronizing everything. 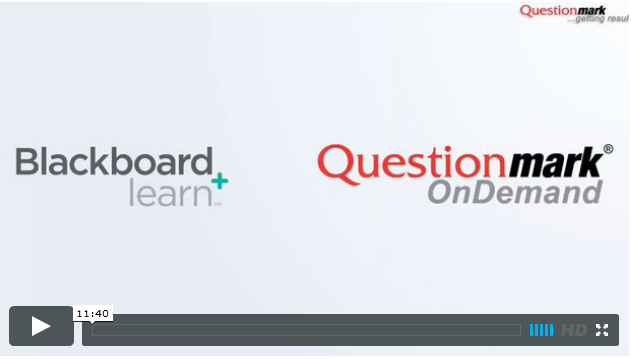 Enjoy this video about integrating Questionmark with Blackboard using the Questionmark Blackboard Connector, and let me know if you have any questions! What’s new in the Blackboard Connector? We recently published an updated version of our Blackboard Connector for Blackboard Learn 9.1. This version contains some compatibility improvements but is mainly to introduce support for more roles in the synchronization process. Blackboard Learn supports the IMS LTI protocol so, in theory, you could integrate directly to Questionmark OnDemand without the custom building block. Our development focus is definitely towards replacing the block, eventually, with an LTI-based solution, however, at the moment the building block provides more functionality than the LTI protocol allows so we’re recommending that Blackboard customers stick with the connector. That doesn’t mean development of the Connector has stopped though, as this latest version demonstrates. The Blackboard Connector contains synchronization logic which ensures that users of courses are synchronized with users and groups in the Questionmark repository. This synchronization is automatic and controllable using options in the Connector. It is possible to achieve some interesting use cases such as restricting access to the block on a course-by-course basis by controlling groups in your Questionmark repository. This level of control is not available in the LMS itself. Until recently, we only supported three roles: Students, Instructors and Teaching Assistants. Students automatically become Questionmark participants and the other two roles are mapped to administrator profiles created in the repository. If either of the administrator profiles were missing, all users would be denied access to the Connector. In the latest version, the situation is more controllable. Not only can you synchronize Course Builders and Graders too, but you can turn synchronization on or off for any of the default LMS roles simply by creating or deleting the corresponding profile in Questionmark Enterprise Manager. I’m pleased to say that the Blackboard Connector has been updated on the Questionmark website! The connector now comes in three flavours. We’ve matched the version numbers to make it as simple as possible to identify the right connector for your environment. Connector 9.1 is for users of Blackboard 9.1 (the latest version of Blackboard’s Learning Management System). Connector 9.0 is for users of Blackboard 9.0. Finally, Connector 8.0 is for Blackboard Learn 8. All versions have updated user interfaces to improve the look and feel within the Blackboard environment; we’ve also improved the synchronization of users and groups, added synchronization of assessment folders and improved the integration with the Blackboard content system. Oh, and by popular demand we’ve changed the assessment selection drop-down so that it now shows the available assessments organized by their assessment folders. This change will make it much easier to control access to the assessment lists too. The 9.1 connector has all the above improvements and more! With Blackboard 9.1 you can now copy Questionmark content items between courses, including using the course copy tool and the content import/export facilities. As you can see, we’ve made some significant changes to these connectors. Thanks to everyone who tested out the community edition prior to this release – your comments and feedback were invaluable. Questionmark Perception easily integrates with various third-party applications using “standards-based” integrations or specifically created connectors. A great example of this seamless integration is Perception and Blackboard. Using the Questionmark Perception Blackboard Connector enables institutions to integrate the best-of-breed assessment management and delivery features of Perception with the learning management features of the Blackboard Learn™ Platform. Blackboard instructors can seamlessly access Perception to create and modify Perception assessments. Once the assessments are created the Blackboard instructors can assign them to various courses available on their Blackboard course web site. Students can launch their assessments from within Blackboard. Perception will then mark the answers provided before passing the results back to Blackboard. For information about how to install the Blackboard Connectors for Perception, click here.